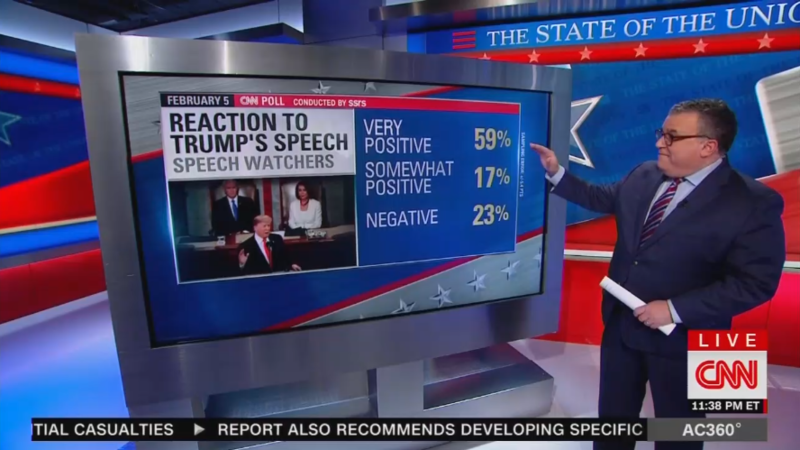 I want you to see that very positive number, how that compares to Donald Trump’s performances in the last couple of years when he has given a speech to a joint session of Congress like this. You’ll see that, again tonight he was again at 59 percent. He was down at 48 percent very positive a year ago. Back when he first started the job and he addressed the Congress, he was at 57 percent. So he is back up. This is a — this is a speech-watching audience that was more receptive this year than last year to what they saw. DAVID CHALIAN: At least those who watched. This is our first look at a brand-new instant poll, but it is among speech watchers. So I just want to stress here, for a State of the Union address, the President’s partisans, his supporters tend to turn out to watch the speech. This is true of a president of either party. So tonight, we saw a heavily Republican skewed audience turn out to watch the President’s speech. But look at this. A very positive reaction from those who watched the speech tonight. 59 percent very positive. 17 percent somewhat positive. 23 percent negative. But here’s the rub. Even this very favorable audience to Donald Trump does not believe his call for bipartisanship is going to meet with success. Take a look. Will Donald Trump increase bipartisan cooperation? A majority of speech watchers, again, a heavily Republican audience, 53 percent say no. 39 percent say yes. So all that talk of bipartisanship seems to be being met by with the people who watch the speech by a healthy dose of skepticism, Wolf.